Although we are smack in the middle of the trade winds, cruising without too much short term concern, we have an eye out for down the road… namely, our first destinations of Ducie, Pitcairn, and Gambier, which are at fairly far latitudes to the south (~25 degrees S). Our friends on the catamaran Coco de Mer, from North Carolina, did a fast passage to Easter Island, and then just yesterday were getting their butts kicked by a storm near Pitcairn, on their way to Gambier. We’ve been getting their daily reports by satellite; as well as another boat called Stella Polaris, with a Norwegian crew, who opted to backtrack north for two days to avoid the bad weather. They were waiting for a weather window to shoot towards Gambier, which is the southeastern most archipelago of French Polynesia. I believe you can read Coco de Mer’s updates on http://www.cocoabroad.com – they battled some westerly winds and 10 foot seas with the front, and made it to Gambier yesterday fairly frazzled. Stella Polaris is just now sailing west towards Gambier with north winds, about to weave between two fronts and then get big seas from the south. Not an enviable situation. Also to our east 300 miles is a catamaran called Pakia Tea (second word is pronounced “Teh-Ah”) with an Austrian couple, they are tentatively bound for Easter Island. All three of these boats we met in Galapagos and have young crews in their 30s/40s, which is the minority in the cruising community.. now we are all heading to the same region so staying in close communication. It is great to have this impromptu community of friends underway, to share our positions with one another on a daily basis for safety — and also for encouragement that we’re not all alone out here! We are intent on our plans to visit Pitcairn and reach Gambier but the priority is for crossing the Pacific safely, so we’ll be keeping a sharp eye on the weather (and experiences of our friends). Photo: shows the current rain band moving across a big area of the Pacific, and converging wind barbs around Pitcairn which will produce very rough seas. 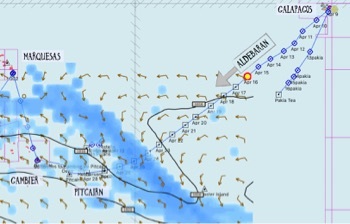 This is a screenshot from our Open CPN navigation software, you can download your own weather charts at PredictWind.com and put our ship’s lat/long position with their route tool. Glad to hear you’ve got this network out there….safe passage maties!!! Captain Kristian you always make the safest and smartest decisions. Good to know u are in communication with others ahead of you. It’s great to have the advance information. Lets hope the rains subside by the time you get there!